Nate running the Eiger Ultra Trail’s 16 km course. Photo courtesy of Alpha Foto. The Eiger, with its world-famous North Face, towers over the Swiss village of Grindelwald. The foreboding rock and ice wall looms large in the storied history of Alp mountaineering. And, now, the name has been bestowed upon one of the great new trail races in Switzerland, the Eiger Ultra. A few weeks ago, the race attracted over 1,400 runners from 29 countries—truly a remarkable number for a newcomer on the trail race scene. 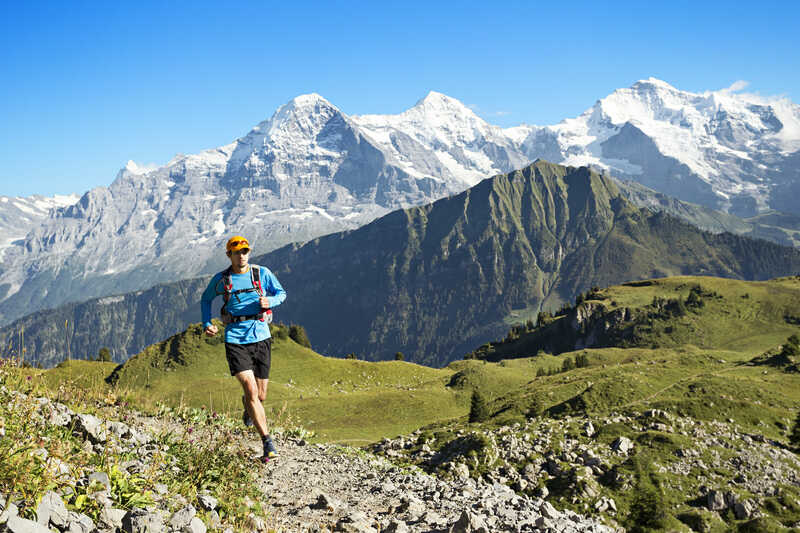 Best known for its rigorous 101-km course, the Eiger Ultra Trail also features two other races—a mid-range 51 km ultra, and a far more approachable, 16 km “Pleasure Trail,” which, happily for many participants, has nothing “ultra” about it! It was on this latter course that my husband, Nate Moore, found himself on race day. 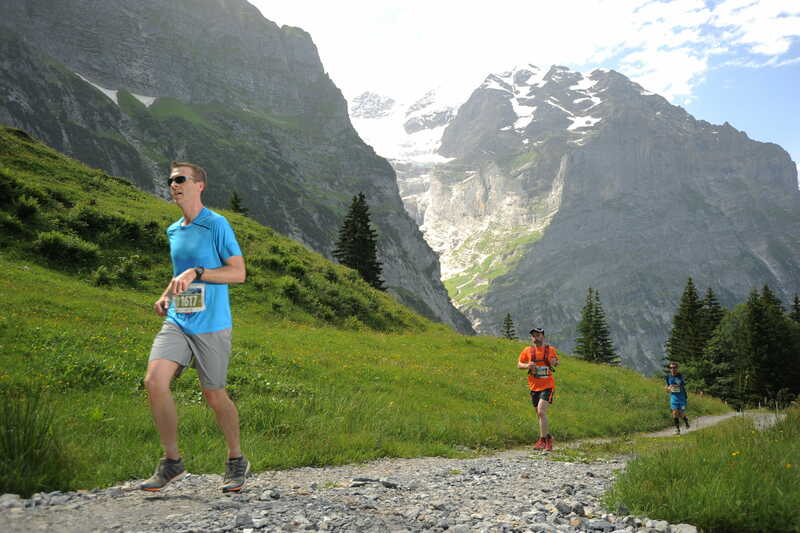 While more ambitious runners might want to tackle one of the two longer courses, the 16 km event has plenty to offer, including steep uphill climbs, spectacular mountain views and a challenging descent through a cow pasture to the Grindelwald finish line. At the same time Run the Alps founder Doug Mayer was running the 51 km course of the Eiger Ultra Trail, Nate was getting ready for the Pleasure Trail. Instead of starting at 4:30 am for the 101 km course, or even 7:00 am for the 51 km course, Pleasure Trail runners get to sleep in and arrive at the starting line by 10:00 am. As for Nate, our two boys still woke him at dawn on the day of race, so no extra hours of rest for him! Even though I didn’t get to run the Pleasure Trail, I find that cheering on runners is the next best thing. I pulled out our small, but noisy little Swiss bells from my backpack. The boys and I started ringing them and yelling loudly. While I was excited for Nate and the other runners as they began their uphill journey into the woods, I couldn’t help but feel a little bit nervous for him too, even though I knew he was prepared. 2014 marks the Eiger Ultra’s second anniversary. Last year, 225 brave runners finished the Pleasure Trail course. In 2014, the number of runners grew to 331 – an impressive 50 percent increase in one year. Considered a course suitable for trail running beginners, the Pleasure Trail adds up to 16 km and 960 meters of elevation gain, along with a steep downhill return to the finish line. In terms of trail conditions, about one-third of the course is on asphalt, while the majority is on trails or forest roads. Also, Pleasure Trail runners don’t retrace their steps; the course is a loop that starts and ends in the same location in the center of scenic Grindelwald. Unlike the two other Eiger Ultra Trail races held on the same day, the Pleasure Trail doesn’t have a mandatory packing list and require an equipment inspection by race officials. You only need your more typical race staples like running shoes and clothes. There’s no need for things like whistles, insulation blankets and adhesive elastic bandages, for example. And, how long does it take to run the Pleasure Trail? Finishing times for both men and women in 2014 ranged from about 1.5 hours to 4.5 hours. No matter what, you have to be done by 3:00 pm. I’m very happy to report that Nate had a great race and went faster than he anticipated. In fact, the boys and I actually missed him at the finish line because we expected a later arrival! When we finally caught up with him after the race, he was feeling good. He held a plastic cup filled with non-alcoholic Swiss beer—free for runners with the voucher attached to their bib. (At least one study apparently found that non-alcoholic beer helped people recover after a marathon?). Nate really only had positive things to say about the Pleasure Trail. He enjoyed seeing the expansive views of the Alps and the peacefully grazing Swiss cows. His only negative comments had to do with the heat—a high of about 32°C or nearly 90°F. Although, he did mention some narrow paths closely bordered on either side by electric fences that made him a little nervous! Not only was he feeling good, but his results weren’t bad either. He came in 43 out of 121 for his age category. And for his overall results, when including all the male runners who finished the Pleasure Trail, he was in about the top 25 percent. I felt very proud of him and his accomplishment. Maybe next year, Nate and I will both run the Pleasure Trail? Or, there’s even a couples version of the 51 km race—although I’m not sure it would be good for our marriage (we’ve argued while trying to paddle a 2-person kayak). However, the 2013 winners of the couples race had wonderful things to say about their experience. Either way, we may be looking for babysitters next summer in Grindelwald, as the Eiger Ultra Trail has something to offer trail runners of all levels—with some advanced preparation and a positive attitude, of course—both of which served Nate very well in this year’s race.